Don’t have a gamingtent/clan to call your own to join us with at CampZone? 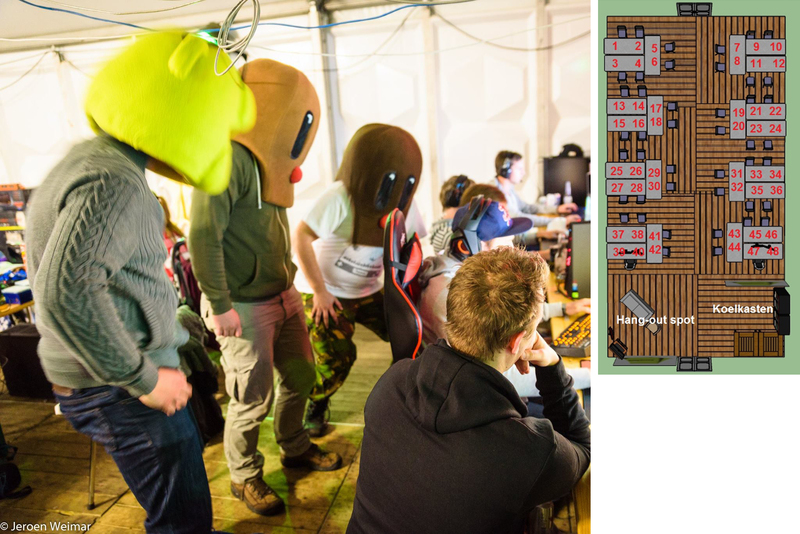 Then the Tent voor Tentloze Nerds is your place to be! It doesn’t matter if you visit us by yourself or with a group of friends, the Tent voor Tentloze Nerds has plenty of room and fun to offer! On this page you will find all the information you might need about this aluminum pop-up tent. Will we see you in the TVTN this year? Tickets are now available in our webshop, for 80 euro for the full event (eleven days of CampZone), 50 euro for a weekend or 55 euro for Monday to Friday. CampZone is a unique event where we basically organize a camping for gamers on a wide open field. We like to see the Tent voor Tentloze Nerds as the living room of CampZone for visitors. The TVTN is equipped with all sorts of useful items, like chairs, tables, internet access, fridges, electrical outlets and even a BBQ. Getting a good night’s rest isn’t something you generally achieve with a lot of other people around you. The Tent voor Tentloze Nerds provides a living room, but you yourself need to take care of a proper place to sleep at CampZone. It doesn’t matter whether you decide to sleep in a tent or a caravan, just don’t forget to pack it. The CampZone terrain has a food area with a few stands where you can buy food and drinks every day. Prefer getting your supplies at the local grocery store? No problem! The nearest supermarket is only a few minutes drive away from us. The Tent voor Tentloze Nerds will be equipped with two fridges (both with freezer) and a barbecue! We never know in advance how busy the Tent voor Tentloze Nerds will turn out to be. Besides the actual ‘tentless nerds’, this tent will probably see a daily rotation of new and exciting guests. All the more fun, we say! For example, you might come across various cosplayers, indie developers, journalists, streamers and more! We’ll do our best to get you in touch with some of best and nicest people withing the gaming industry! There’s always someone present in the TVTN to whom you can go to with questions and problems. Together with the other crew within the TVTN they can help you with almost everything, even with getting teams together for the many activities and competitions that CampZone has to offer. Note: A ticket for the TVTN grants you the right for a seat in and use of the Tent voor Tentloze Nerds. It is still required to buy a regular CampZone ticket to be granted access to the event CampZone itself.